TCFA’s longtime guitar instructor Bill Gregg will present “The Art of the Guitar,” a concert of his original compositions for the classical and the 12-string guitar. The performance is Saturday, April 30, 7pm, in the TCFA auditorium. These works have been composed over the past 30 years and, while sometimes intricate and challenging, they emphasize Bill’s focus on making beautiful, uplifting music. The pieces incorporate jazz and traditional blues, as well as Asian influences. One piece, “Geometer,” utilizes a scale from Japanese court music for the classical guitar solo, while a contrasting second part is played on the 12-string in a traditional open blues tuning. Offering an opening set will be Bill’s advanced student, Cole Vermillera, who will also join in on Bill’s program for some duets. Admission is by donation at the door, with all proceeds benefiting TCFA. 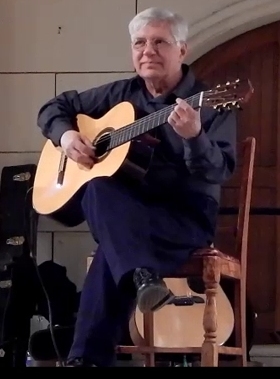 Bill Gregg taught guitar in the early years of the conservatory, left to pursue a career in biotechnology and returned to the TCFA faculty in 2003. In addition to teaching, he performs traditional Appalachian folk music and acoustic blues. He also composes experimental and ambient electronic music. His three recordings of electro-acoustic music are frequently played on radio and internet streaming programs that feature electronic and ambient music. In 2015 his computer/synthesizer/piano piece, “Opening Mind,” was included in the collection Ambient Skyline Part II, issued by the Moscow recording label, Galileo Dreams.